Flying Eye Books, 2013. 100 pages. Counting books that go all the way up to 100 are something special. This one is a little bizarre and a little random, but I found it charming and would want it for my kids if they were still learning to count. It’s too long for a storytime, but I can imagine kids poring over it at home the way my son spent hours with the Where’s Waldo books when he was a child. As you will guess by the 100 pages, there’s basically a number on each page of this book. But it tells a general story as it counts, helped along by the pictures. The story is not a terribly coherent one, but it generally makes sense, and you see the same six bears and the same eight hunters throughout the book. The rest of the book follows their strange journey with the hunters sometimes being chased and sometimes chasing them and sometimes just, apparently, partying. There are a few ways you can tell the book was originally published in Europe, and not a lot of effort was made to Americanize it. On the picture of the 15th floor, there’s a light on in what American’s would call the 16th floor (since Americans call the ground floor the first floor). The bears get sick with “fevers of 39 degrees C,” and weights are given in kilos, and heights in centimeters. 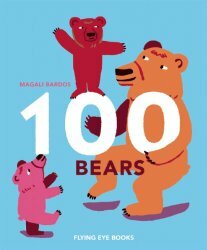 But while the story doesn’t exactly hold together, it does circle back to “100 trees… The forest.” And I find it the delightful sort of book you can look at again and again, examining details and, of course, counting.